Yesterday got away from me. I had a lot scheduled in the morning, but wanted to take my kids out somewhere to do something fun in the afternoon. I thought I might take them to a movie or maybe on a hike. At the very least we were going to go out to a park. After my morning and early afternoon appointments, I walked into my office, which is where the gerbils live, and I found two of the girls, Scissorpaws and Jefferie, scuffling and covered in blood. COVERED in blood. Because I'm smart, I broke up their fight with my hand. That wasn't the bite that caused all my bleeding though. 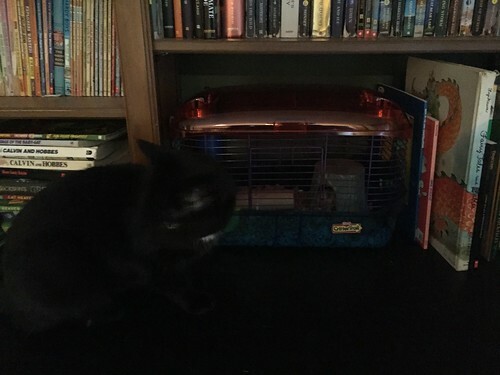 I knew I had to separate the two fighters, so I tried to pick up Scissorpaws to put her in my gerbil travel cage and that is when I got the bite that caused all my bleeding. I called to Sam to bring me the phone and a towel for my finger and I was covered in blood and the gerbils were covered in blood and I did a really goddamn good job of traumatizing my first born, so let's just call that a win, okay? Then I had to make an emergency call to the vet. Ironically, when the vet receptionist asked, "Is this an emergency or can I ask you to hold?" I told her I could hold because I evidently am not willing to admit I am making an emergency call even if I am making an emergency call. I panicked a little when I was trying to figure out how to get both animals to the vet without creating a tiny cage match in my car because I only have one travel cage. Sam is the brilliant one who suggested I put one of them in Tupperware. He's smart. And level-headed. I used scissors to stab air holes in the lid though—AND I did it BEFORE I put the gerbil in it—so I'm not completely useless. This is after they came home from the vet. There was a lot less blood by this point. I was sitting in the waiting room at the vet hospital when it occurred to me that a gerbil bite might be, you know, bad for me as well as the gerbils. I texted my sister the doctor to ask her how likely it was that I would die from a gerbil bite and she told me that it was likely and I should get treated. I found this upsetting, but reasonable. I left the gerbils with the vet, who was giving them fluids and anti-inflammatories and antibiotics and pain medicine because those poor little guys were ripped up. They really did a number on each other. Also, If we were to determine how much money I spent per ounce of gerbil on this visit, well, let's just say I was already depressed enough and also unable to count that high in my semi-agitated state. Happily, all the treatment those little guys needed gave me ample time to, you know, get a tetanus shot. 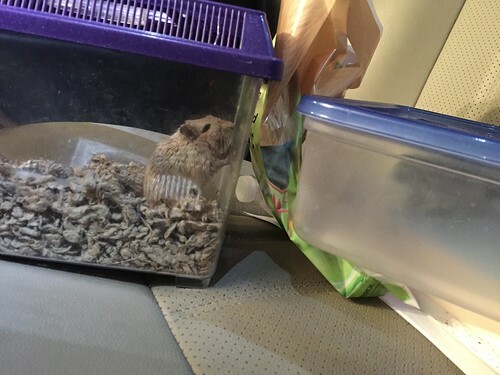 Before I was able to go to a human doctor though, I had to go to the pet store to get new gerbil cages because clearly these two gerbils will never be able to live together again and also I can't trust them with Jetpack, who remained unscathed through the great Gerbil Fiasco of 2015. Then I waited at an urgent care clinic for an hour and a half for a doctor to confirm that I had, in fact, been bitten by a gerbil and should get a tetanus shot. It then took six minutes for a nurse to give me said tetanus shot and put a bandaid on my finger. The gerbils still weren't ready, even though they'd been at the vet for three hours, so I drove home and assembled my new gerbil cages. Then I went to the vet to trade a million dollars for my damaged gerbils and their medicines, which need to be administered via teensy syringes twice a day for ten days. I very carefully put the gerbils in their new cages, which turned out to be veeeeeery interesting to the cats. I put them way back on a shelf, surrounded by books so the cats couldn’t push them off of the shelf. Guess what happened right after I did this? It turns out when you purchase cheap less expensive cages, they are much lighter than glass tanks and cats have the ability to maneuver them around. I heard a crash and ran into the office to find that the cats had knocked Jefferie's cage to the ground and the poor gerbil, although still safely in the cage, thank God, was presumably not very happy, so I moved the new cages with their new residents to my bedroom behind a now permanently closed door so the cats don't use them as maracas. Thus far I've administered medicine to them twice and no one has been bitten, which, yay! I also haven't developed tetanus, so I feel pretty good about that, even if my arm hurts where I got the shot. Both Jefferie and Scissorpaws seem to be doing okay, although they are pretty beat up. Poor kiddos. I have no idea what set them off. But silver lining, at least now we get to hear the scribble scrabble of gerbil paws on plastic all night long, so there's that. Fingers crossed for a quick and pain-free recovery for them. I think this incident may have scared me straight from getting new rodents for a while. Oh, no! I'm so sorry that this happened. I feel horrible. I hope that the gerbils and your (tetanus-free) hand are on the mend. I read in one of our gerbil care books that if the dominant gerbil in a cage starts getting weaker with age, the other gerbils will sometimes fight to claim dominance. The fights are particularly ugly among female gerbils, for some reason. Perhaps that's what is going on for your gerbils. There isn't really much you can do beyond what you've already done. I know how traumatic it can be, though--it happened back when we got our first pair of gerbils. They didn't get along right from the start, and after a blood-soaked battle on their third day at our house, we ended up having to exchange them for our current gerbils, who have been getting along swimmingly for 1.5 years now. I do worry about what will happen between ages 2-3, though. Oh, and tell Sam that this violent and traumatic little adventure was part of his education. You can't very well be a caregiver for younger children without knowing how to stay calm and collected at the sight of blood and screaming; into every parent's life an emergency room visit or two must fall. Sending healing vibes to all of you! First rule of Gerbil Fight Club: ALWAYS...no, wait, NEVER, mess with the one called Scissorpaws. That's interesting about the weakening of gerbils. That could very well be what is happening. I remember when that happened with your first gerbils. That was totally traumatic. It seems like it worked out all right though. I mean, unless you are on your second set of hamsters and second husband after the untimely demise of the number ones, that is. Oh, how I chuckled at this. Not so much the situation, but how you wrote about it. I hope everyone is now on the mend. You made me think about the time I took a hamster to the vet because she had diarrhea. Boy, did I get some looks in the waiting room. At that time we had two hamsters, Betty and Howard. This was years ago, and they are both now in hamster heaven.